We have seven 'John Cabot' climbing roses in a magnificent hedge, with branches, that hang down to the ground. We are trying to train one of them to go over the roof of the new gazebo. We have a path of concrete slabs from Eeyore's thistle patch to the gazebo. On the other side we have a line of day lilies yellow and brown in colour, bee balm (Monarda), (mauve), shasta daisy, primroses, a volunteer alpine strawberry and a river of hostas. In the middle of this triangle we have very large, medium and small plastic terracotta coloured pots filled with tomatoes, peppers (bell), lettuce, herbs (Basils various varieties), and edible flowers (marigold, nasturtiums and calendula). I look forward to when I can start munching on the lettuce and flowers. I found a die cast miniature of a John Deere tractor in their colours. I have placed it in one of the pots so the farmer can plow the 'fields' later on. Klaus has finished moving the concrete slabs here to make the walkway in front of the roses and behind the lilies. The walkway is a rose walkway through and through as rose petals rained down like confetti on Klaus working. He was even festooned with them. A small patch of lawn will be left after the pond, with water fall and stream goes in. Pondering Place. There are fairies in our pond! The pond and stream are now almost finished as we close down for the winter. The cosmos got so big we had to pull them out. Yikes! We couldn't see the stream anymore. We will have a pond area that will include Walton's mountain containing, the head waters of Ruthard Falls flowing into the mighty Ruthard river and on into a Pondering place. We will have a rock garden, marginal plants and perennials and pond plants. Somewhere in this area we will have a cut leaf Japanese maple, pendulous style. I would like to have a cute fairy statue, I saw, that looks like she is going to dip her hand into the water. We think we want an Island in the pond and a bridge. This is all down the line. This is the newly constructed Gazebo. We already love it. It is a great place to eat a meal, talk or just sit and think and look at the garden. The other night we were sitting in it at the height of the full moon ... it was lovely. The moon will shine right onto the pond and into the Gazebo. Wow! Would like to have lights of some kind in the garden along the pathways. Here is where the Rose Walkway meets up with the walk from the patio. We are using more of the left over bricks from the old perennial border that the gazebo sits on. 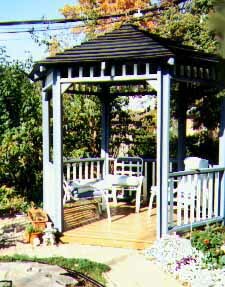 The gazebo itself is small: 8' across and 10' high to the top of the roof. Behind the gazebo it is total shade so have planted hostas, ferns, violets and, this year to fill in, nicotiana 'Domino white' to give a splash of white to brighten it up. I have 3 kinds of hostas (Funkia) so far. A blue 'Blue Cadet, a variegated 'Antioch' and solid. I have the following ferns Lady's Fern, Osmunda regalis, 'Purpurascens' Purple Royal Fern, Osmunda royale; Athyrium nipponicum, 'Metallicum', Japanese Painted Fern; Adiantum pedatum, 'Northern Maidenhair', Dryopteris filix-mas 'Undulata Robusta', male fern. I have at the very back Veronica gentianoides "Variegata'. I hope I spelt these alright. I have a planter filled with morning glories 'Heavenly blue' and nasturtiums 'Mixed' at the west side of the gazebo hoping they will shade us later on. Klaus made a unique trellis from two plastic ladder trellis'. It looks very Art Deco. The morning glories are nearly up to the top of the trellis, July 6th. They grow like weeds. I have a couple of pots that I put seedlings in on either side of the morning glories the squirrels have a great time digging them up. I' ll have to put wire or tree branches over them. July 16 the morning glories are up onto the roof heading east. Stephanie found some cool looking stones and I have built a Inukshuk (ee nook sook) out of them. It is standing in front of the gazebo.